In the preceding two parts of this monograph we have treated the most recent phases in the formation of planets and satellites. In doing so, we have adopted the actualistic principle. Starting from the present properties of planets and satellites, we have traced their history back in time in an attempt to find how these bodies have accreted from smaller bodies. The formation of jet streams is an essential intermediate stage in this sequence of hetegonic events. (1) The grains should have dynamic properties such that after accretion they form celestial bodies with the orbits and spins that we observe today (with the exception of instances where post-accretional events such as tidal interaction have played a part). (2) The grains should have such chemical and structural properties as to explain the properties in the present small celestial bodies (comets, asteroids, meteoroids) as well as the composition of planets and satellites. It is the purpose of this and the following chapters to investigate by what processes a population of grains with these required properties could have originated. It is reasonable to assume that the formation of the solar system involved a gaseous nebula. The first question to answer is whether this medium could be analyzed without considering electromagnetic effects. The criterion for justified neglect of electromagnetic effects in the treatment  of a problem in gas dynamics is that the characteristic hydromagnetic parameter L is much less than unity. where PB, , and are the magnetic permeability, the electrical conductivity, and the density of the medium, respectively; B is the magnetic field strength; l is the linear extent of the medium; and c is the velocity of light (Alfvén and Fälthammar, 1963, pp. 102-103). In cosmic problems involving interplanetary and interstellar phenomena L is usually of the order 1015-1020 (table 15.1.1). In planetary ionospheres it reaches unity in the E layer. Planetary atmospheres and hydrospheres are the only domains in the universe where a nonhydromagnetic treatment of fluid dynamic problems is justified. TABLE 15.1.1. Characteristic Quantities for Laboratory and Cosmic Plasmas. In a circumstellar region such as that where our solar system was formed, partial ionization is necessarily impressed on any dilute gas not only by electromagnetic radiation from the star but also by electron collision caused by currents associated with the emplacement of matter and the transfer of angular momentum. In fact, any theory of the formation of a solar system must envisage that the formative processes necessarily released gravitational energy amounting to several thousand eV per atom. Such a large release of energy must lead to a considerable degree of ionization (unless highly improbable processes are postulated; see further ch. 23). As mentioned already in sec. 1.4.4 these theoretical arguments are supported by observations of strong magnetic fields and plasma chemistry effects in dark clouds. Hence a careful study of hydromagnetics and plasma physics is an absolute necessity for understanding the origin of the solar system. When treating the medium out of which the solar system formed we choose to use the convenient term "plasma" instead of "partially ionized gas" also to semantically emphasize the necessity of taking magnetohydrodynamic effects into account and to stress the generality of thermal disequilibrium between grains and gas. This term also points out the fact that much knowledge about the basic hetegonic processes can be obtained from laboratory plasma research and, for example, magnetospheric research; these important sources of validation have not been used in other studies of the evolution of the solar system. The degree of ionization in hetegonic plasmas and in cosmic plasmas in general may vary over a wide range, depending on the specific process considered. It is of importance down to very low values; in a plasma of solar photospheric composition with a degree of ionization as low as 10-4 , for example, the major part of the condensable components is still largely ionized. More specifically, in the present chapter we analyze the general requirements of a hetegonic model for the production of grains, whereas in chs. 16 and 17 we suggest a specific model derived essentially on the basis of the dynamics and properties of cosmic plasmas. This model is applied to interplanetary and transplanetary condensation in chs. 18 and 19. (1) We go further back in time. (2) Plasma physics, which is essential to any realistic discussion of processes in space and hence also to the discussion of the formation of grains,  is a much more complicated and less well developed field than is celestial mechanics, which was the basis of parts A and B. One of our problems then is how we should proceed in order to reduce the hypothetical character of our analysis as much as possible. This requires first a clarification of what is actually known in cosmic plasma physics and also where the major uncertainties lie (secs. 15.2 and 15.3). Because plasma physics is essential to the understanding of the early phase of evolution of the solar system, we give here a brief survey of its present state. Plasma physics started along two parallel lines, one mainly empirical and one mainly theoretical. The investigations in the field that was called "electrical discharges in gases," now more than a hundred years old, was to a high degree experimental and phenomenological. Only very slowly did it reach some degree of theoretical sophistication. Most theoretical physicists looked down on this complicated and awkward field in which plasma exhibited striations and double layers, the electron distribution was non-Maxwellian, and there were many kinds of oscillations and instabilities. In short, it was a field that was not at all suited for mathematically elegant theories. On the other hand, it was thought that with a limited amount of work, the highly developed field of kinetic theory of ordinary gases could be extended to include ionized gases. The theories that thus emerged were mathematically elegant and claimed to derive all the properties of a plasma from first principles. The proponents of these theories had very little contact with experimental plasma physics, and all the poorly understood phenomena that had been observed in the study of discharges in gases were simply neglected. In cosmic plasma physics, the modern experimental approach was initiated by Birkeland (1908), who was the first to try to bring together what is now known as laboratory plasma physics and cosmic plasma physics. Birkeland observed aurorae and magnetic storms in nature and tried to understand them through his famous terrella experiment. He found that when his terrella was immersed in a plasma, luminous rings were produced around the poles (under certain conditions). Birkeland identified these rings with the auroral zones. As we know today, this was essentially correct. Further, he constructed a model of the polar magnetic storms supposing that the auroral electrojet was closed through vertical currents (along the magnetic field lines). This idea also is essentially correct. Hence, although Birkeland could not know very much about the complicated structure of  the magnetosphere, research today follows essentially Birkeland's lines, supplemented, of course, with space measurements; see Dessler (1968), Bostrom (1968; 1974), Cloutier (1971), and Falthammar (1974). Unfortunately, the progress along these lines did not proceed uninterrupted. Theories about plasmas, at that time called ionized gases, were developed without any contact with the laboratory plasma work. In spite of this, the belief in such theories was so strong that they were applied directly to space. One of the results was the Chapman-Ferraro theory, which soon became accepted to such an extent that Birkeland's approach was almost completely forgotten, and for 30 or 40 years it was seldom even mentioned in textbooks and surveys. All attempts to revive and develop it were neglected. Similarly, the Chapman-Vestine current system, according to which magnetic storms were produced by currents flowing exclusively in the ionosphere, took the place of Birkeland's three-dimensional system. The dominance of this experimentally unsupported theoretical approach lasted as long as a confrontation with reality could be avoided. Such a confrontation was ultimately brought about by the conclusion from the theoretical approach that plasmas could easily be confined in magnetic fields and heated to such temperatures as to make thermonuclear release of energy possible. When attempts were made to construct thermonuclear reactors the result was catastrophic. Although the theories were generally accepted, the plasma itself refused to behave accordingly. Instead, it displayed a large number of important effects that were not included in the theory. It was slowly realized that new theories had to be constructed, but this time in close contact with experiments. This "thermonuclear crisis" did not affect cosmic plasma physics very much. The development of theories could continue in this part of the field since they dealt largely with phenomena in regions of space where no real verification was possible. The fact that the basis of several of these theories had been proven to be false in the laboratory had little effect; this fact was either ignored or met with the arguments that failure in the laboratory would not necessarily imply failure in space. The second confrontation came when space missions made the magneto sphere and interplanetary space accessible to physical instruments. The first results were interpreted in terms of the generally accepted theories or new theories were built up on the same basis. However, when the observational technique became more advanced it became obvious that these theories were not applicable. The plasma in space was just as complicated as laboratory plasmas. Today, in reality, very little is left of the Chapman Ferraro theory and nothing of the Chapman-Vestine current system (al though there are still many scientists who support them). Many theories that have been built on a similar basis are likely to share their fate. As a result of new factual knowledge, the "first approach" has been proven to describe only the properties of the "pseudo-plasma," a fictitious medium, which has rather little to do with real plasma. Hence we must now take a "second approach" (Alfvén, 1968). The characteristics of the two approaches are summarized in table 15.3.1. Theories are mathematically elegant and very "well developed"
....in reality synonymous, convey different general notions. The first term gives an impression of a medium that is basically similar to a gas, especially | the atmospheric gas we are most familiar with. In contrast to this, a plasma, particularly a fully ionized magnetized plasma, is a medium with basically l different properties: Typically it is strongly inhomogeneous and consists of l a network of filaments produced by line currents and surfaces of discontinuity. These are sometimes due to current sheaths and, sometimes, to electrostatic double layers. If we observe an aurora in the night sky we get a conspicuous and spectacular demonstration of the difference between gas and plasma behavior. Faint aurorae are often diffuse and spread over large areas. They fit reasonably well into the picture of an ionized gas. The degree of ionization is so I low that the medium still has some of the physical properties of a gas that is homogeneous over large volumes. However, in certain other cases (e.g., when the auroral intensity increases), the aurora becomes highly inhomogeneous, consisting of a multitude of rays, thin arcs, and draperies a | conspicuous illustration of the basic properties of most magnetized plasmas. In the solar atmosphere the border between the photosphere and the chromosphere marks a transition similar to that between the two auroral states. The photosphere can be approximated as a homogeneous medium, at least to some extent, but in the chromosphere and upwards we have a typical plasma, a basic property of which is inhomogeneity manifest in filaments, streamers, and flares. To describe the chromosphere by means of homogeneous models and according to the pseudo-plasma theories is a, fundamental mistake that has often led to conclusions and conjectures that are totally divorced from reality. Following Birkeland, the first laboratory experiments with reference to cosmic physics had the character of scale-model experiments (Malmfors, 1945; Block, 1955, 1956, 1967; Danielsson and Lindberg, 1964, 1965; Schindler, 1969; Podgorny and Sagdeev, 1970; Ohyabu and Kawashima, 1972; Falthammar, 1974; and Bostrom, 1974). Such investigations demonstrated, however, that no real scaling of cosmic phenomena down to laboratory size is possible, partly because of the large number of parameters involved which obey different scaling laws. Hence, laboratory experiments should aim at clarifying a number of basic phenomena of importance in cosmic physics rather than trying to reproduce a scaled-down version of the cosmic example. There is now a trend to shift from configuration simulation to process simulation. (1) Quite generally a magnetized plasma exhibits a large number of instabilities. Lehnert (1967a) lists 32 different types, but there seem to be quite a few more. (2) A plasma has a tendency to produce electrostatic double layers in which there are strong localized electric fields. Such layers may be stable, but often they produce oscillations. The phenomenon is basically independent of magnetic fields. If a magnetic field is present, the double layer cuts the frozen-in field lines. A survey of the laboratory results and their application to cosmic phenomena (especially in the ionosphere) has been given by Block (1972) and by Falthammar (1974). (3) If a current flows through an electrostatic double layer (which is often produced by the current itself), the layer may cut off the current. This means that the voltage over the double layer may reach any value necessary to break the circuit (in the laboratory, say 105 or 106 V; in the magnetosphere, 104-105 V; in solar flares, even 1010 V). The plasma "explodes," and a high-vacuum region is produced (Carlqvist, 1969; Babic et al., 1971; Torven, 1972; Bostrom, 1974) (see also fig. 15.3.1). FIGURE 15.3.1.- Electrostatic double layers or sheaths are often produced in a plasma. The figure show an electrostatic discontinuity produced spontaneously. The only function of the magnetic field is to keep the discharge away from the walls in order to ensure that the observed phenomena are not due to wall effects. Over the double layer a voltage drop is produced which sometimes suddenly became large (~105 V) and may disrupt the discharge. FIGURE 15.3.2. Simple model of a filamentary current structure in a low-density plasma. Currents flow parallel to the magnetic field. The lines in the figure represent both current paths and magnetic field lines. The magnetic field derives partly from an external axial field and partly from the toroidal field produced by the current itself (see Alfvén and Fälthammar, 1963). The current is strongest at the axis and becomes weaker further away from the axis as depicted by the decreasing thickness of the lines. ...p. 193) (see also fig. 15.3.2). This is one of the reasons why cosmic plasmas so often exhibit filamentary structures. The beautiful space experiments by Lüst and his group (see Haerendel and Lust, 1970) are illustrative in this connection (although not yet fully interpreted). (5) The inevitable conclusion from phenomena (1) through (4) above is that homogeneous models are often inapplicable. Striation in the positive column of a glow discharge and filamentary structures (arc and discharge lightning at atmospheric pressure, auroral rays, coronal streamers, prominences, etc.) are typical examples of inhomogeneities. Nature does not always have a horror vacui but sometimes a horror homogeneitatis resulting in an amor vacui. For instance, a magnetized plasma has a tendency to separate into high-density regions such as prominences and coronal streamers and low-density "vacuum" regions; e.g., the surrounding corona. the interaction becomes very strong and leads to a rapid ionization of the neutral gas. The phenomenon is of importance in many thermonuclear experiments as well as in space, and we discuss it in detail in ch. 21. (7) The transition between a fully ionized plasma and a partially ionized plasma, and vice versa, is often discontinuous (Lehnert, 1970b). When the input energy to the plasma increases gradually, the degree of ionization jumps suddenly from a fraction of 1 percent to full ionization. Under certain conditions, the border between a fully ionized and a weakly ionized plasma is very sharp. (8) Flux amplification: If the toroidal magnetization in an experimentally produced plasma ring exceeds the poloidal magnetization, an instability is produced by which the poloidal magnetization increases at the expense of toroidal magnetization (Lindberg et al., 1960; Lindberg and Jacobsen, 1964). This phenomenon may be of basic importance for the understanding of how cosmic magnetic fields are produced (Alfvén, 1961; Alfvén and Lindberg, 1974) (see also fig. 15.3.3). FIGURE 15.3.3. Geometry of the Lindberg plasma ring experiment. (a) Before leaving the gun, me plasma has a toroidal magnetization B. It is shot through the radial field N-S. (b) On leaving the gun, the plasma ring pulls out the lines of force of the static magnetic field. (c) Plasma ring with captured poloidal field. 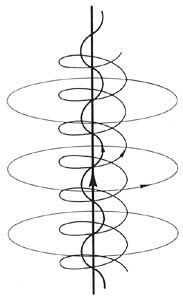 If the toroidal magnetic energy is too large, a part of it is transferred to poloidal magnetic energy (through kink instability of the current). (d) The poloidal magnetic flux during the above experiment. The upper curve shows how the ring, when shot out from the gun, first acquires a poloidal flux . An instability of the ring later transforms toroidal energy into poloidal energy thus increasing the flux from to , The upper and lower curves represent the flux measured by two loops at 15 and 30 cm distance from the gun, respectively. 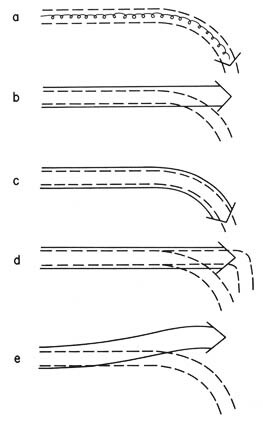 ...where the field lines bend, a laboratory plasma may deviate in the opposite direction to the bend of the field lines (Lindberg and Kristoferson, 1971) (see also fig. 15.3.4), contrary to what would be natural to assume in most astrophysical theories. (10) Shock and turbulence phenomena in low-pressure plasmas must be studied in the laboratory before it will be possible to clarify the cosmic phenomena (Podgorny and Sagdeev, 1970). (11) Further physical experiments of importance include studies of magnetic conditions at neutral points (Bratenahl and Yeates, 1970). Condensation of solid matter from plasma differs from condensation of a saturated or supersaturated gas at low temperature. This is partly because of the pronounced thermal disequilibrium that develops between radiation. cooled solid grains and a surrounding, optically thin, hot gas. Important effects may also arise because of the marked chemical differences between neutral and ionized components of mixed plasmas. Cosmic plasmas contain at least 20 elements controlling the structural and major chemical properties of the solid materials that form from them. With this degree of complexity, condensation experiments in partially ionized media are a necessary complement to theoretical considerations if we wish to understand the chemical record in primordial solid materials. Such experiments are discussed by Arrhenius and Alfvén (1971) and by Meyer (1969, 1971). Thus we find that laboratory investigations begin to demonstrate many basic plasma properties previously unknown or neglected. These properties differ drastically from those assumed in many astrophysical theories. The difference between the laboratory plasma and the plasma of these theories may in some cases be due to the dissimilarity between laboratory and space, but more often it reflects the difference between a hypothetical medium and one that has physical reality. The treatment of the former leads to speculative theories of little interest except as intellectual exercises. The latter medium is basic to the understanding of the world we live in. The study of cosmic physics in intimate connection with laboratory physics is now well under way in the field of magnetospheric physics. A recent review of the results is given by Falthammar (1974). Of special interest are the investigations by Bostrom (1974), which show that substantial voltage drops may occur along the geomagnetic field lines in the lower magnetosphere, so that the ionosphere is decoupled from the magnetosphere. These effects are relevant to understanding the concept of partial corotation, which is introduced in ch. 17. (1) Fundamental principle: Premagnetohydrodynamic models (Laplace, von Weizsäcker, Kuiper, Berlage, Cameron, and others) and "first approach" theories (Hoyle) are of limited interest. We should follow the "second approach" as defined above. This implies that we should rely to a large extent on laboratory and space experiments, especially those which are specifically aimed at the clarification of hetegonic problems. (2) Extrapolation from magnetospheric physics: The transfer of angular momentum from a rotating magnetized central body to a surrounding plasma has some similarity to the present situation in the terrestrial magnetosphere. The hetegonic situation differs from this in two respects: (a) The plasma density must have been much higher. (b) The present solar wind effects (magnetic storms, etc.) may not necessarily be very important. An extrapolation of our knowledge of the magnetosphere encounters difficulty because this field is not yet very advanced. Space research has certainly supplied us with a wealth of observations, but the theories are not yet well developed. Most theories are of the pseudo-plasma type and hence of limited interest. Systematic attempts to transfer laboratory plasma knowledge to the magnetosphere (according to the principle of the "second approach") have been made by Lindberg, Block, and Danielsson. The works of these authors have been referred to elsewhere in our discussion; a survey of recent results is given by Falthammar (1974). If a and b are connected by a magnetic field line, an electric discharge along this field line from a to the point b may take place (fig. 15.4.1; see also Stenflo, 1969). The current circuit is closed by currents in the photosphere. The current along the magnetic field line is the basic phenomenon in prominences. A filamentary current of this type has the property of sucking ionized matter from the environment into itself. This phenomenon is somewhat similar to the pinch effect (Alfvén and Falthammar, 1963). As a result, the density in the prominence is orders of magnitude larger than in the surrounding corona. At the same time, the temperature is orders of magnitude lower (~104 K in the prominence compared to ~106 K in the corona). FIGURE 15.4.1.- The rotational motion v and the magnetic field in a sunspot may give rise to a voltage between the points a in the sunspot and b outside the sunspot, causing a discharge current I to flow along the magnetic field line from a to b. The circuit is closed through currents below the photosphere from b to c (and back to a). A typical value of the current in a prominence is 1011 amp (Carlqvist, 1969). As the currents in the magnetosphere are typically of the order 105- 106 amp and the linear dimensions are not very different, in both cases of the order of 1010 cm, the solar situation merely represents a high-current and high-density version of the magnetospheric situation. As we shall see, the hetegonic situation generally implies very high currents. Hence to some extent the hetegonic magnetosphere is similar to the present-day solar corona. In some hetegonic planetary magnetospheres, the linear dimensions of the filamentary structures would be comparable to the present-day solar prominences, whereas, in the hetegonic solar corona (the supercorona), the dimensions should be three or four orders of magnitude larger. Unfortunately, most of theoretical solar physics is still in the state of the "first approach" and hence of limited use for our purpose. Still, the analogy between the solar prominences and the hetegonic filamentary structures is important because it may reduce the hypothetical ingredients of the model. Hence, a reasonable model is that of a rotating magnetized central body surrounded by a network of prominence-like structures joining the surface of the central body with a surrounding plasma. It is interesting to note that Chamberlin (1905) and Moulton (1905) connected their "planetesimal" theories with solar prominences, although in a different way. (4) Extrapolation from dark clouds and stellar envelopes: During the era of formation of planets and satellites, the amounts of gas falling into the circumsolar region from surrounding regions of space probably gave rise to coronal-type concentrations in a volume comparable to the size of the solar system. The production or capture of solid particle condensates in the filamentary structures extending through this medium must have been high enough to produce at least the total mass of companion bodies 1030 g) in a time period of the order of 108 yr. In the dark clouds, observable  today, gas and dust densities occur which are sufficient to permit gravitational accretion of the necessary mass in 107-108 yr.
Other objects which conceivably have a bearing on solar system formation are stars with optically thin envelopes of silicate dust. The relatively common occurrence of these attests to the substantial duration of the phenomenon. The fact that the central stars in such systems are of widely varying types ranging from early to late types of stars (Neugebauer et al., 1971; Stein, 1972) suggests that, in general, the circumstellar matter is gathered by the star from outside rather than being ejected from the star itself. At the present time it is uncertain how close the parallelism may be between dark clouds, circumstellar envelopes and our solar system in its formative state. The continued, refined investigation of these objects is of great interest from a hetegonic point of view. Particularly important is the information which is being gathered about plasma phenomena such as magnetic fields and the ion-molecule reactions in optically opaque dark clouds. Figure 15.4.2 is an attempt to illustrate the general scheme along which astrophysical theories should be developed in order to be realistic and consistent with observations. FIGURE 15.4.2.- An illustration of the present strategic situation m astrophysics. Before we are allowed to combine them with observations, the "first-approach" theories. must he processed through the laboratory where many of their ingredients. will no doubt be filtered away. This is the only way of building up astrophysics with a mini mum of speculation. We have to learn again that science without contact with experiments is. an enterprise which is. likely to go completely astray into imaginary conjectures. In part B we studied the accretion of grains to asteroids, planets, and satellites. In sec. 11.7 we derived some properties the grains must have had. We shall try here to find a model of the process that provides a suitable original population of grains for the accretional process. As we have found, the requirements for such a model are essentially as follows. (1) In the environment of a central body, a large number of grains should be produced which move in Kepler orbits in the same sense as the spin of the central body. This implies a transfer of angular momentum from the central body to the medium surrounding it (see chs. 16 and 17). (2) The orbits of the grains are bound initially to be ellipses with considerable eccentricites. In sec. 11.7.4 values of e > O.1 or e > O.3 have been suggested. (3) The structure and chemical composition of these grains should be consistent with those components of meteorites which appear to be primordial condensates; furthermore, the composition should also be consistent with that of the bodies later formed from them by accretion (i.e., those we observe today) (chs. 20-22). (4) The space density of matter should vary in the way indicated by figs. 2.5.1 through 2.5.4. This means that we cannot accept a state where the density distribution has any resemblance to a uniform Laplacian disc. To the contrary, both around the planets and around the Sun there should be certain regions with high density surrounded by (or interspaced with) regions with much lower density. (5) As the transfer of angular momentum is necessarily a slow process, the medium to be accelerated must be supported against the gravitation of the central body until the centrifugal force is large enough to balance the gravitational force (sec. 16.4). (6) The orbital axis of each system is close to the spin axis of its central body. Thus, regardless of the fact that the spin axis of Uranus is tilted 97°, all its satellites lie in the equatorial plane of the planet, not in the ecliptic plane. The requirements (1), (5), and (6) specifically suggest that the model we are looking for must employ hydromagnetic effects. Indeed, there are wellknown hydromagnetic processes that are able to transfer angular momentum from a magnetized rotating central body to a surrounding plasma (Alfvén, 1943b; Alfvén and Falthammar, 1963, p. 109). Furthermore, the magnetic fields may support a plasma against gravitation (Alfvén and Falthämmar, 1963, p. 111), at least for a certain length of time (until instabilities develop). However, the mass that can be suspended with reasonable values of the magnetic field is orders of magnitude smaller than the total distributed solar-system mass, as will be shown in ch. 16. This implies  that the mass density existing in the cloud at any particular time during the hetegonic age must be orders of magnitude lower than the total distributed mass density. This is possible if plasma is continually added to the nebula from outside and is concurrently removed from the cloud by condensation and accretion. This state will be discussed in sec. 16.5. In the following chapters we shall show that the angular momentum transfer, support of the cloud, and capture or condensation of grains with the specific properties observed in meteoric material can all be attributed to some rather simple hydromagnetic processes. As was stated at the outset, we are abstaining in this work from consideration of theories that do not offer an explanation of the basic structural similarities within the four well-developed hetegonic systems within our solar system. At this point it seems worthwhile, however, to mention briefly some of the existing theories on the origin of the planetary system alone that have received attention in the literature over the past three decades. A somewhat arbitrarily chosen list includes the work of von Weizsacker (1944), Berlage (1930 1948), Kuiper (1951), Cameron (1962, 1963, 1973), Hoyle (1960, 1963), Hoyle and Wickramasinghe (1968), McCrea (1960), Schmidt (1944 1956), and ter Haar (1948). Detailed reviews of the work of some of these authors may be found in ter Haar (1967). Most of these theories start by postulating properties of the primeval Sun for which there is little observational evidence. Hence the basic assumptions of these theories are highly speculative. Furthermore, hydromagnetics and plasma effects are usually neglected making these theories (see sec. 15.1) primarily interesting only from a historical point of view. FlGURE 15.6.1.- Schematic representation of Hoyle's theory. 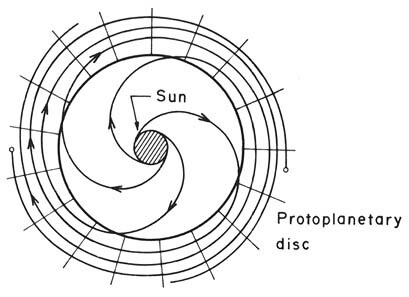 According to Hoyle (1960), the rotation of the primeval Sun would have produced highly spiralized magnetic field lines both in the Sun and in its surroundings. The figure shows only eve turns but Hoyle's theory requires 100 000 turns storing an energy of 5 X 1045 ergs Hoyle claims that this magnetic energy caused the protoplanetary disc to expand and form the planetary system if Hoyle's mechanism were physically reasonable, it would have had important technological applications. But as shown both theoretically (Lundquist, 1951) and experimentally (Lindberg et al, 1960; see also fig. 15.3.3), such a configuration is unstable and can never be achieved. If we forget for a moment the question of hydromagnetic processes, a theory that has some elements of special interest is that of Schmidt (1944 to 1959). This is essentially a planetesimal accretion theory and treats what, in some respects, has been covered in part B along similar lines. The theory assumes that the Sun captured swarms of small particles and bodies from interstellar clouds. Schmidt's theory, further developed by B. J. Levin, E. Ruskol, and V. Safronov, has attracted considerable interest as a theory for the formation of satellites and particularly for the formation of the Moon. In ch. 24 it is shown that the Moon is not relevant in discussing the formation of satellites around the planets. But it is not immediately obvious that Schmidt's theory cannot be applied to the regular satellite systems. According to this theory, the matter now forming the satellites was injected into the neighborhood of the central body in parabolic or hyperbolic orbits  which, through viscous effects (mutual collisions), were transformed into the present nearly circular orbits. Hence the picture is similar to the conditions we have discussed (Alfvén, 1942, 1943a, 1946) prior to formation of jet streams. However, a main difference is that the grains we have treated acquire their angular momenta from the plasma from which they are condensing or in which they are captured electromagnetically. In Schmidt's theory, the angular momentum is due to an asymmetric injection of dust grains from "outside." A number of objections can be raised against this process. (1) The asymmetric injection is an ad hoc assumption. It has not been shown that any reasonable dynamic distribution of grains in space can lead to such an asymmetry. (2) The grains collected by a system should give the central body a certain angular momentum per unit mass and, at the same time, give the satellites angular momenta per unit mass which are two or three orders of magnitude larger (see figs. 2.3.1-2.3.4). It is difficult to see how this could be achieved by the mechanism invoked. (3) The spin axis of Uranus is tilted by 98°. (In secs. 13.5-13.6 we ascribe this to the statistical accretion which gives the planets their spins.) The Uranian satellite system is perhaps the most regular and undisturbed of all systems, with the remarkable property that the satellites move in the equatorial plane of Uranus with circular orbits of negligible eccentricity and inclination. The angular momentum transferred by the Schmidt mechanism should produce satellites moving in the orbital plane of the planet. (4) The cloud of dust which captures the injected dust must extend far beyond the present orbits of the satellites. Suppose that a cloud with radius R captures grains from "infinity." We know from sec. 13.5 that the value of Z in eqs. (13.3.4-13.3.6) is not likely to be more than about 10 percent. This means that the momentum which the cloud gains does not suffice to support the final orbits at a distance larger than r = Z2R = R/100. For the outermost Saturnian satellite Iapetus, rIapetus = 3.56 X 1011 cm. This means that the cloud must extend a distance of 3.56 X 1013 cm. This is far outside the libration or Lagrangian point which can be taken as the outer limit of the gravitational control of Saturn. It seems unlikely that these objections to Schmidt's theory of satellite formation can be resolved without introducing too many ad hoc assumptions. On the other hand, the jet streams in which the satellites are formed must, according to our model, necessarily capture some of the grains of the planetary jet stream in which the central body is accreting. Hence Schmidt's mechanism deserves further attention. For example, a satellite may accrete a considerable number of grains that would have impacted on the planet if they had not been captured by the satellite.